From river to sea, there&apos;s abundant beauty in Wilmington and our Island Beaches. Social media makes it easier than ever to capture and share that beauty. You might be wondering where to get that Insta-worthy gram on your next visit. From whimsical gardens and a historic battleship to oceanside sunrises and a maritime forest, we&apos;ve rounded up some of the best photography locations. Inspire trip envy from all your friends when you visit these top Instagram-worthy spots in Wilmington and our Island Beaches. There are a lot of beautiful places in #WilmingtonNC. #WheninWilmington make sure to stop off at these Instagram spots. Walk along the nearly two-mile Riverwalk to snap scenic views of downtown Wilmington and the Cape Fear River. Pop in to eclectic shops in historic buildings like The Cotton Exchange or Chandler&apos;s Wharf. Stop off at waterside eateries like Elijah&apos;s Restaurant, The George on the Riverwalk or The Pilot House and have a cold one on the water at Anne Bonny&apos;s Bar & Grill or Marina Grill. At the foot of Market Street and Water Street share your photo from in front of the Southern Hospitality sculpture along the Wilmington Riverwalk. The larger-than-life sculpture celebrates the Venus flytrap, which grows naturally only within a 75-100 mile radius of Wilmington. The Battleship NORTH CAROLINA is one of the most decorated battleships of WWII and today is moored along the Cape Fear River, silhouetting downtown Wilmington. Self-guided tours are offered daily, snap a selfie on the top deck or go behind the scenes with Battleship 101 and other special events throughout the year. The new Battleship Memorial Walkway provides stunning views of the Cape Fear River and is perfect for getting that Insta-worthy shot of the Wilmington skyline. Airlie Gardens is home to formal gardens, ten acres of lakes, wildlife, more than 75,000 azaleas and the iconic Airlie Oak, which dates back to 1545. With 67-acres and walking paths, it&apos;s easy to spend a day amongst the beauty of Airlie Gardens snapping pictures. While everything here is photogenic, popular spots include the Airlie Oak, Butterfly House, Bottle Chapel and Pergola Garden. Showcase your #WrightsvilleBeach vacation with snapshots of island experiences, watersports action and beach beauty. Known as a &apos;SUP&apos; hub, you&apos;ll often see people out on the water on standup paddleboards or getting a workout in along The Loop. When not soaking in the rays, indulge in surf-inspired cocktails poolside, in lush gardens and at waterside restaurants. The only concrete pier in the state, cast a line and snap a photo from Johnnie Mercers Pier. Located in the heart of Wrightsville Beach, you&apos;ll also find a tackle shop and seasonal snack bar in the Pier House. On the very north end of Wrightsville Beach at Shell Island, capture photos of serene stretches of the shoreline and also home to bird sanctuaries. The Intracoastal Waterway is popular for boating, standup paddleboarding, kayaking and other watersports. Explore by boat, take an eco-cruise and take photos as you venture to the uninhabited Masonboro Island or set sail on a sunset cruise for Insta-worthy captures. Local outfitters make it easy to try your hand at various watersports with SUP and kayak rentals as well as guided tours and lessons. Share your SUP selfie using the hashtag #MyWBAdventure. Pour out your hopes and dreams on pen and paper and place it inside the Wrightsville Beach Mailbox and make sure to take a picture. Found on the north end of the island, people have ventured to this mysterious mailbox to clear their conscience or just write down words and thoughts. The dreamy, lone mailbox on the beach makes for a perfect photo. This is the second version of the mailbox, with the original on display in the Wrightsville Beach Museum of History. #CarolinaBeach is known for its laid back beach vibe that encourages you to be yourself and capture those memories on camera while doing so. From the iconic Boardwalk to drinks over the ocean, Carolina Beach is filled with abundant photo opportunities found #OnlyinCB. Pop in the famous Britt&apos;s Donut Shop to snap a pic of your half dozen, venture to oceanside eateries, and capture a selfie from atop one of the amusement rides here in the summer. The Carolina Beach Boardwalk is the quintessential beach experience to have in-between sand and sun. There are no bad photos when you&apos;re having a cold one over the water at Ocean Grill & Tiki Bar. Enjoy live music on certain evenings and abundant ocean views always. This is a must-stop in Carolina Beach for a one-of-a-kind beach experience and picture-worthy craft cocktails like the Surfer Rosa, Suckapunch, and the Coconut Monk. Explore over six miles of hiking trails and capture the native Venus flytrap on camera as well as waterside views and maritime forest scenery. Carolina Beach State Park welcomes exploration for all. Special events, like a Biological Wonderland Hike, Star Party: A Stargazing Event and Flytrap Family Fun Day show a new side of the park and allow for memorable experiences to capture and share. With boats lined up and the day&apos;s catch comin&apos; off fresh, the Carolina Beach Marina makes for unique photo opportunities. #KureBeach is the beach town you remember as a kid and is packed with natural beauty, nostalgia and wonder. Perfect for those grainy, film-like Instagram shots, at this slice of island paradise you can explore coastal trails, stop by the NC Aquarium at Fort Fisher and see where history was made at state historic sites. Drop a line and grab a photo off the oldest privately owned fishing pier on the East Coast at the Kure Beach Fishing Pier. Stop by the Pier House to play arcade games, enjoy ice cream and find the perfect souvenir to take home. Explore the Basin Trail at Fort Fisher State Recreation Area where abundant photo opportunities include a trail that weaves you in-and-out of a maritime forest, past a WWII Bunker and ends at a stunning overlook with Cape Fear River views. From the endpoint you&apos;ll see Zeke&apos;s Island Reserve, an important shorebird habitat and home to a dynamic landscape of tidal flats, dunes, salt marshes and ocean beaches. The live oaks at Fort Fisher State Historic Site lend to the area&apos;s distinct look and make for not only an Instagram-worthy photo, but photos you&apos;d want to hang on your wall. Twisted from years of salt and wind, the beautiful live oaks make for picture-perfect photos. Plan your visit around low tide to get a glimpse of the Coquina Rocks. From sharks and sea turtles to coral reefs and other animals found under the sea, the NC Aquarium at Fort Fisher is a photographer&apos;s dream. Pose inside the jaw of a Megalodon Shark or snap a boomerang of the mesmerizing jellies. Go on a Behind the Scenes Tour to learn more about the NC Aquarium, see animal care and husbandry areas as well as a live feeding. Special events like the World Famous Weeki-Wachee Mermaids, Alligator Egg Hunt and Trick-R-Treat Under the Sea make the NC Aquarium at Fort Fisher extra fun for families. Some of the images shown were featured in our 2019 Visitors Guide. 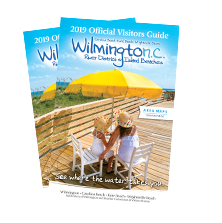 Want to learn more about Wilmington and our Island Beaches, plan your trip and find the perfect place to stay? View our Visitors Guide here.